• TSR082: New Slaves Pat II: Essence Implosion! ZS was founded in 2000 by tenor saxophonist and composer Sam Hillmer. Since the band’s inception ZS has incarnated as everything from a sextet to a duo, most recently featuring Ben Greenberg (electric guitar), and Ian Antonio (drum set), in addition to Hillmer’s signature sax ranting. While ZS' music has been variously categorized as no-wave, noise, post-minimalist, drone, and psych, it is primarily concerned with making music that challenges the physical and mental limitations of both performer and listener. Manipulating extended technique, unique instrumental synthesis, and near telepathic communication, ZS aims to create works that envelop the listener and unfold sonically over time, evoking unspoken past, present, and future rites and ritual. 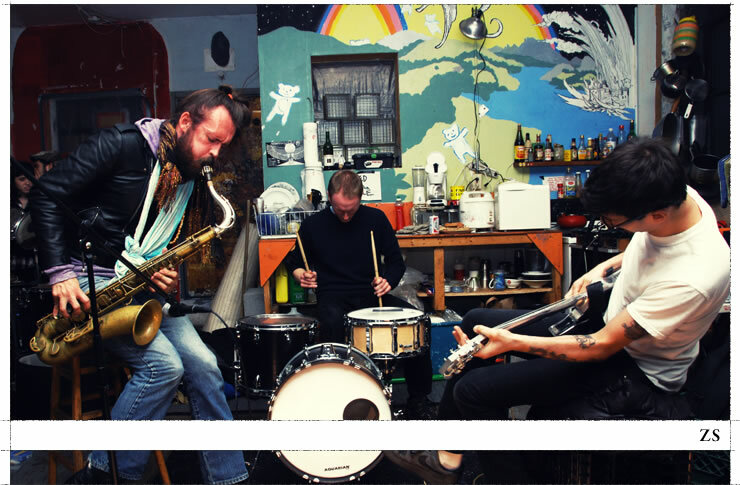 ZS has performed in lofts, galleries, basements, rock clubs, and concert halls across North America and Europe with The Locust, Gang Gang Dance, Animal Collective, Battles, The Dirty Projectors, Dan Deacon, Peter Brotzman and Han Bennick, and Louis Andriessen.